The Course of the River St. Laurence, from Lake Ontario to Manicouagan Point. 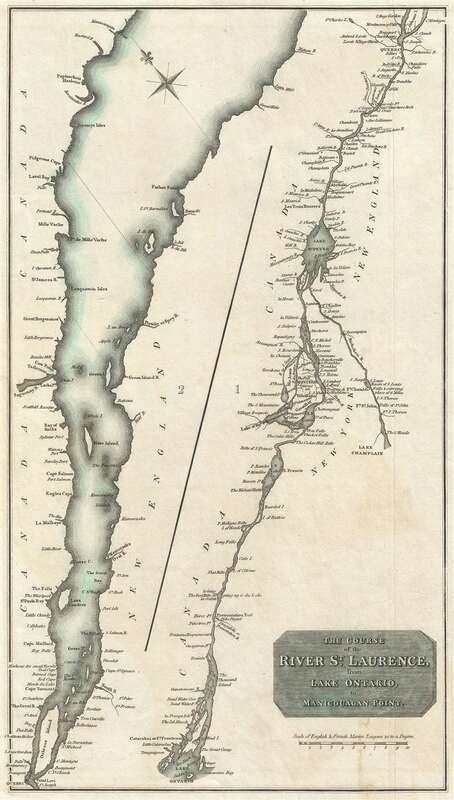 A fine example of John Thomson's 1814 map of the St. Lawrence River from Lake Ontario to Manicouagan Point, Quebec, Canada. Divided into two sections. The left section covers the river from Manicouagan Point to Quebec City. The right section continues along the course of the river from Quebec City to Lake Ontario. The Richelieu River, which connects the St. Lawrence to Lake Champlain is also included in this section. Includes both Quebec City and Montreal. The St. Lawrence River was a critical artery for British Canada and remains an important shipping lane to this day. Thomson no doubt planned this map to capitalize on interest in the river in England spurred by events in the American Revolutionary War and the more recent War of 1812.